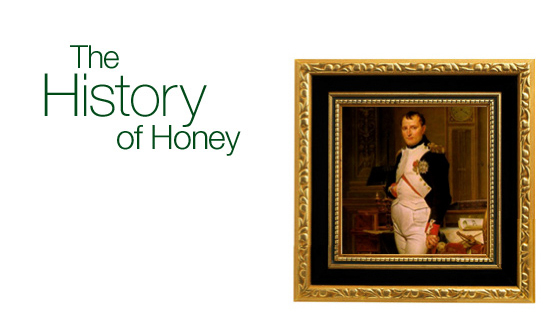 Napoleon used the bee as a symbol of his empire after his coronation in 1804. It stood for industry, efficiency and productivity. Also emblematic of immortality and resurrection, the bee was chosen to link the new dynasty to the very origins of France. In the Bible, this sublime nectar is dubbed "the heavenly food." To the ancients, honey was a source of health, a sign of purity and a symbol of strength and virility. Early man considered bees mysterious and magical creatures because their amazing organized labor produced honey - a "nectar for the gods". In Greek mythology, it is said that cupid dipped his arrows in honey to fill the lovers heart with sweetness. In biblical days, John the Baptist lived on a diet of wild locust and honey. In 50 BC, the Romans painted pictures with melted dyed beeswax. The earliest illustration we have of honey being gathered is around 15,000 years old and appears in a painting on the walls of a rock shelter in eastern Spain. In the early centuries B.C., the Ancient Greeks made little honey cakes from flour, honey and oil, sometimes baked with fresh flowers inside them, as supplications to their gods. They considered honey to be an important food as well as a healing medicine. Democritus (460-370 BC), Greek philosopher and physician, chose a diet rich in honey and lived until he was 109 years old. In the first century A.D., Apicus, a wealthy Roman gourmet, wrote a series of books in which more than half the recipes included honey. Physicians in ancient Rome used honey to help their patients fall asleep. Honey was the most used medicine in ancient Egypt. Of the more than 900 medical remedies we know about for that time, more than 500 were honey based. The Egyptians kept their bees in tall, cylindrical hives; similar hives are still used in remote parts of Egypt today. The beer that the first Anglo-Saxons drank was a brew of water and honeycomb in a clay pot, with the addition of herbs for flavoring. For thousands of years, honey and fruits were the only sweeteners in Europe. Napoleon used the bee as a symbol of his empire after his coronation in 1804. It stood for industry, efficiency and productivity. Also emblematic of immortality and resurrection, the bee was chosen to link the new dynasty to the very origins of France. Golden bees (cicadas really) were discovered in 1653 in Tournai in the tomb of Childeric I (father of Clovis) who founded the Merovingian dynasty in 457. They were considered to be the oldest emblem of the sovereigns of France. The colonists first brought honeybees to North America, but in Central America, the indigenous peoples had long kept bees. In Nice, France, Christmas is celebrated with nougat blanc, a candy made of honey, almond and egg white. Spring, in Poland, is greeted with glasses of honey wine and the Jewish New Year is welcomed with honey cake or apples dipped in honey, to insure a sweet life in the year ahead. In 1984, honeybees constructed a honeycomb in zero gravity as part of an experiment on a space shuttle. In 1984, a backstage worker at the Paris opera established one of the most unusually sited beehives on the roof of the opera house. The "opera bees" gather their nectar as they visit flowers all over the city of Paris. The fruits of their labors are on sale in the souvenir shop of the opera.